Glioblastoma multiforme (GBM) is a common intracranial neoplasm with a very poor prognosis. Radiotherapy (RT) alone with different fractionation schedules and dose escalation has not improved overall survival. Addition of temozolomide to radiation therapy of GBM has radically increased survival. The subset of patients with epigenetic silencing through methylation of the promoter gene which metabolizes temozolomide (0–6 methylgaunine DNA Methyltransference [MGMT]), shows a survival of 46% at 2 years. The flip slide of increased survival is the appearance of delayed toxicity due to radiation, the most bothersome of which is neurocognitive decline. Gliomas constitute the most common intracranial tumors. GBM continues to be a challenging neoplasm. Recent advances in delivery of radiation therapy like intensity-modulated radiation therapy (IMRT) have not shown any discernible improvement in survival. IMRT, however, has the potential to redistribute radiation such that more homogeneous dose delivered to tumor while reducing radiation dose to organs at risk (OARs). The overall survival following temozolomide with radiation therapy is now around 14–16 months with a 2-year survival of 26%. The current challenge in the management of GBM is to enhance abnormally low overall survival but without increasing neurocognitive decline or other late consequences of radiation therapy. Murine models have shown a decline in neurocognitive function after radiation which corresponds with increased apoptosis in hippocampus, a decrease in hippocampal cell proliferation, and overall decrease in neurogenesis. The concept of highly undifferentiated neural stem cell (NSC) characterized by self-renewal and proliferation is at the heart of neural plasticity repair renewal even in the adult brain. The largest neurogenic region in adult mammalian brain is subventricular zone (SVZ). A similar neurogenic system is seen in subgranular zone (SGZ)., It is suggested that NSC is similar to cancer stem cells (CSCs). There is an indirect evidence that sparing NSC niches compromises the outcome as much as it may decrease neurocognitive abilities. This retrospective study is to address this specific controversy, to spare, or not to spare NSC niches. This study will also assess the impact on survival of sparing stem cell niches in the brain while treating patients with GBM. The case files of patients treated for GBM from 2010 to 2016 were retrieved for assessment. Low-grade glioma, meningioma, and anaplastic astrocytoma were not included in the analysis. Patients were grouped as IMRT and non-IMRT, depending on the technique of radiation therapy. Patients in non-IMRT group received radiation therapy with coplanar fields with three-dimensional conformation but with no constraints assigned to stem cell niches. Patients treated with stem cell sparing IMRT had constraints assigned to stem cells + niches. Patients underwent biopsy, subtotal resection, and near-total resection or else referred as gross-total resection. All the patients were immobilized in a thermoplastic mold in treatment position. Magnetic resonance imaging (MRI) scan of the brain with axial thickness <1.5 mm was taken. Computed tomography (CT) scans with intravenous administration of contrast was obtained in treatment position. MRI was fused with RT-planning head CT scan with axial slice thickness <2.5 mm. Contouring was done on MRI and RT-planning CT scan fusion slices. We did not contour the entire hippocampus, but focusing mostly on the subgranular zone (SGZ). Contour was done on T1-weighted MRI axial sequence. Given the preponderance of gray matter in the hippocampus, focus contouring on the T1-hypointense medial to the temporal horn. SVZ was contoured as 5 mm expansion along the lateral margin of the lateral ventricles on axial planning CT-Scan fused with MRI Scan. The SGZ of hippocampus was contoured as per Radiation Therapy Oncology Group 0933 contouring Atlas More Details. Patients in both the groups received 60 Gray (Gy) in 30 fractions over 6 weeks. Temozolomide was administered orally for 6 weeks on every day. The dose varied from 120 to 140 mg. Adjuvant 3 weekly temozolomide for six–eight cycles was administered. The dose varied from 300 to 350 mg daily for 5 days. The same was repeated every 3 weeks if hematological parameters were acceptable. A Kaplan Meier curves were generated using the facility in STATA 14.2. A cursory examination of the two curves, one each for IMRT and 3DCRT, shows differences between the two treatments. However, the significance test, log-rank test, indicates otherwise. The chi-square of the test is 1.67 and the Pr > χ2 = 0.1960. Hence, the hypothesis that the survival from the two treatments do not significantly differ. 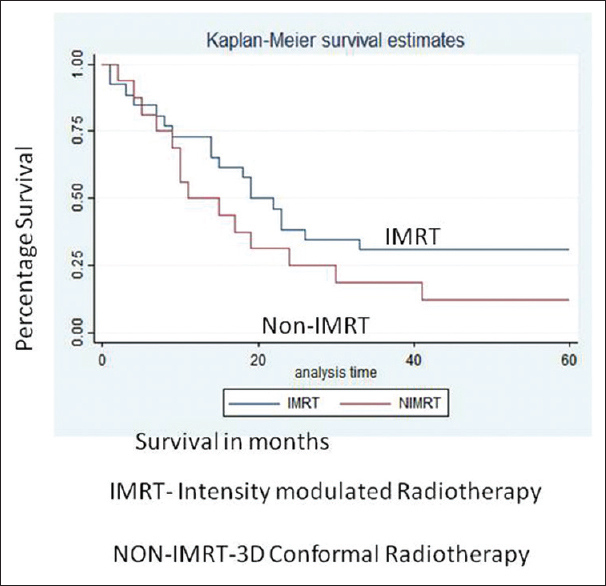 [Figure 1] shows the Kaplan Meier survival curve for IMRT and non-IMRT group. [Figure 2] shows survival probability with time. The event studied and recorded for overall survival was death. IMRT with stem cell sparing was introduced in our department from 2010. Patients who have undergone radiation from 2010 to 2016 have been analyzed. Patients who consented to receive IMRT were treated with stem cell sparing technique. Twenty eight patients were treated with IMRT and 18 with non-IMRT techniques. There was a male preponderance in IMRT group. The mean age was 58.5 and 54.4 years in IMRT and non-IMRT group, respectively [Table 1]. Patients were scheduled to receive 60 Gy in 6 weeks and 30 fractions with weakened breaks. Two patients in each of the groups received <50 Gy while others received between 50 and 60 Gy with conventional fractionation. 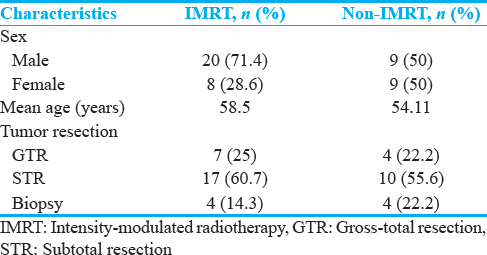 Gross-total or near-total resection was performed in 7, that is, 25% of patients in IMRT group while it was 4 patients (22.2%) in non-IMRT group. Four patients in each of the groups had only biopsy while rest of them underwent subtotal resection [Table 1]. The mean dose to contralateral SVZ was 27.96 Gy in IMRT group and 32.60 Gy in non-IMRT group while dose received by ipsilateral SVZ was 47.19 and 48.53 Gy in IMRT and non-IMRT group, respectively. Maximum dose to contralateral and ipsilateral SVZ was 49.29 and 59.53 Gy in IMRT group. Similarly, in non-IMRT group, dose to contralateral and ipsilateral SVZ was 45.5 and 59.14 Gy. Minimum dose received by contralateral SVZ was 9.1 Gy in IMRT group and 19.45 Gy in non-IMRT group while minimum dose received by ipsilateral SVZ was 19.87 and 35.3 Gy in IMRT and non-IMRT group, respectively. 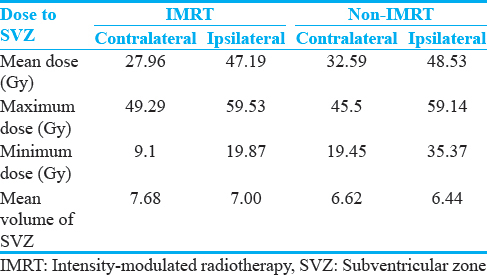 The mean volume of contralateral SVZ was 7.68 and 6.62 cc in IMRT and non-IMRT group while mean volume to ipsilateral SVZ was 7.00 and 6.44 cc in IMRT and non-IMRT group, respectively [Table 2]. The reference isodose line for planning target volume (PTV) was 95% in all patients. Comparing operating system (OS) with technique has no statistical significance P = 0.66. The overall survival in both the groups was 19.22 months with a median follow-up duration 22.27 months (range: min − 17.08–ma × 38.24 months). Comparing overall survival (OS) with technique has no statistical significance P = 0.66. The overall survival in both the groups was 19.22 months with a median follow-up duration 22.27 months (range: min - 17.08months, max- 38.24 months). Comparing overall survival (OS) with Total Dose has a HAZARD RATIO=0.97 (0.91 - 1.05) has no statistical significance P =0.56. Comparing overall survival (OS) with Minimum Dose has a HAZARD RATIO=0.99 (0.97 - 1.01) has no statistical significance P =0.83. The problem of neurocognitive decline is gaining greater relevance following increased overall survival, even in GBM. Neurocognitive decline can be seen as early as 4 months but increases overtime. Toxicity data from low-grade glioma patients treated with radiation dose of 50 Gy were reported on actuarial decline of 5.3%. Hundreds of patients with GBM undergo radiation annually. The survival outcomes have improved but still remain low. The quality of life hence becomes an overwhelming concern. GBM remains a fatal disease despite improvements in surgical techniques as well as radiation therapy. Addition of temozolomide with radiation therapy as an adjuvant has improved the survival in certain subsets of GBM. Enhancing survival of patients without compromising neurocognitive abilities is the current goal. In fact, the response assessment in neuro-oncology working group has recommended neuro-cognitive outcomes to be considered as one of the primary end point. Neurotoxicity following radiation therapy may be immediate, acute, and delayed. White matter degeneration is a common histological feature noted. NSC located in SVZ and SGZ shows division and tropism. Following injury, this capacity for regeneration is retained over the time though it declines as one gets older. NSCs demonstrate exquisite in situ radiosensitivity. Thus, decline in neurocognition is a consequence of sensitive NSCs undergoing depopulation in the midst of pro-inflammatory environment induced by radiation. Redmond et al. demonstrated higher neurocognitive deficits at 6 and 12 months if the mean radiation dose to bilateral SVZ was high (38–48 Gy). In murine models, the relevance of hippocampus degeneration has been demonstrated. Radiation as low as 2 Gy can induce apoptosis, inhibition of hippocampal proliferation, and neurogenesis. The impact of radiation on hippocampus and NSCs residing in niches has shown some interesting facets of neurogenesis and cognition. Briefly, NSCs are very sensitive to radiation. Radiation can inhibit proliferation and neural plasticity and stunting neurogenesis due to pro-inflammatory action of radiation. Hence, it was a lot of sense to spare NSC and hippocampus to ensure better quality of neurocognitive state following radiation therapy. A hypothesis suggests a distinct possibility of CSC, to emerge from the NSC niches, such as SVZ. It is suspected that NSCs may dedifferentiate into CSC, through a series of oncogene and tumor mutations. It has been reported that GBMs in close proximity to SVZ have decreased survival and a higher rate of multifocal and distant recurrences. Chen et al. in a study concluded that a mean radiation dose 40 Gy or greater to the ipsilateral SVZ was associated with a significantly improved progression-free survival and OS in patients with GBM after GTR.,, Contrary to this, Gondi et al. in preclinical evidence suggested that sparing the hippocampus and SVZ of therapeutic doses of radiation may mitigate neurocognitive decline. IMRT is a newer technique of radiation delivery, which has the potential to enhance conformal radiation therapy as well as reduce radiation to OAR. IMRT enables higher conformation while selectively reducing the dose to OARs, which in this case is a niche for NSCs in SVZ and SGZ. Radiation-related toxicity is now well established. The exact pathogenesis of the same needs further evaluation. Recent discoveries related to activation of NSC in response to injury have given a new direction to repair and misrepair phenomenon. The literature on outcomes following IMRT in the treatment of GBM is sparse. Okonogi et al. demonstrated NSC sparing by linac-based IMRT. Their study showed IMSRT-7 plans resulted in significantly lower biologically effective doses at all four NSC structures. Fuller who reported technical feasibility of IMRT in GBM also demonstrated that there was no survival benefit as compared to historical controls treated with 3DCRT, while Back et al. demonstrated dosimetric improvements to PTV following IMRT as compared to 3DCRT, but again, the survival benefit was not seen. Aherne et al. in contrast summarized that IMRT achieves a superior survival over 3DCRT. However, the role of IMRT would be to spare NSC niches to prevent neural neurocognitive decline and to achieve conformal radiation around the tumor. Achari et al. in their retrospective analysis tell that methylated MGMT status, size of the tumor, and good compliance to treatment are independent of the dose of radiation to SVZ. The study has demonstrated an equipoise between those who were treated with SVZ sparing and those without. There is a nonstatistically significant improvement in survival IMRT group. The impact on neurocognitive status was not one of the end points. The dilemma to spare or not to spare neural progenitor or stem cell needs a large randomized trial controlling for all the variables. Our retrospective analysis demonstrated no difference in overall survival between the groups though the dose received by SVZ in IMRT group was significantly less. In view of the evidence gleaned from multiple small trails and analysis, any attempt to deliberately radiate SVZ and SGZ is experimental and prudence lies in sparing. It is possible that improvements in survival in IMRT group if persists in the larger study may be hypersensitivity response of the peripheral microscopic disease than better coverage of PTV. Hegi ME, Diserens AC, Godard S, Dietrich PY, Regli L, Ostermann S, et al. Clinical trial substantiates the predictive value of O-6-methylguanine-DNA methyltransferase promoter methylation in glioblastoma patients treated with temozolomide. Clin Cancer Res 2004;10:1871-4. Quiñones-Hinojosa A, Sanai N, Soriano-Navarro M, Gonzalez-Perez O, Mirzadeh Z, Gil-Perotin S, et al. Cellular composition and cytoarchitecture of the adult human subventricular zone: A niche of neural stem cells. J Comp Neurol 2006;494:415-34. Khalifa J, Tensgouti F, Lusque A, Plas B, Lotterie JA, Benouaich-Amiel A, et al. Sub ventricular zones: New key targets for glioblastoma treatment. Radiant oncol 2017;12:67. Gonzalez-Perez O. Neural stem cells in the adult human brain. Biol Biomed Rep 2012;2:59-69. Redmond KJ, Mahone EM, Terezakis S, Ishaq O, Ford E, McNutt T, et al. Association between radiation dose to neuronal progenitor cell niches and temporal lobes and performance on neuropsychological testing in children: A prospective study. Neuro Oncol 2013;15:360-9. Adeberg S, Harrabi S, Bougatf N, Bernhardt D, Mohr A, Rieber J, et al. Do increased dose to stem cell niches radiation therapy improve glioblastoma survival. Stem Cell Int 2016;2016:8739462. Chen L, Guerrero-Cazares H, Ye X, Ford E, McNutt T, Kleinberg L, et al. Increased subventricular zone radiation dose correlates with survival in glioblastoma patients after gross total resection. Int J Radiat Oncol Biol Phys 2013;86:616-22. Capilla-Gonzalez V, Bonsu JM, Redmond KJ, Garcia-Verdugo JM, Quiñones-Hinojosa A. Implications of irradiating the subventricular zone stem cell niche. Stem Cell Res 2016;16:387-96. Gondi V, Tomé WA, Mehta MP. Why avoid the hippocampus? A comprehensive review. Radiother Oncol 2010;97:370-6. Okonogi N, Oike T, Shirai K, Tamaki T, Noda S, Suzuki Y, et al. Current advances in radiotherapy for newly diagnosed glioblastoma multiformae. J Neurolphysio 2014;5:4. Oehler J, Brachwitz T, Wendt TG, Banz N, Walther M, Wiezorek T, et al. Neural stem cell sparing by linac based intensity modulated stereotactic radiotherapy in intracranial tumors. Radiat Oncol 2013;8:187. Fuller CD, Choi M, Forthuber B, Wang SJ, Rajagiriyil N, Salter BJ, et al. Standard fractionation intensity modulated radiation therapy (IMRT) of primary and recurrent glioblastoma multiforme. Radiat Oncol 2007;2:26. Back M, Clifford S, Wheeler H, Eade T. Dosimetric improvements utilising intensity modulated radiation therapy for patients with glioblastoma multiformae. J Cancer Ther 2013;4:18-24. Aherne NJ, Benjamin LC, Horsley PJ, Silva T, Wilcox S, Amalaseelan J, et al. Improved outcomes with intensity modulated radiation therapy combined with temozolomide for newly diagnosed glioblastoma multiforme. Neurol Res Int 2014;2014:945620. Achari R, Arursing M, Badgami RK, Saha A, Chatterjee S, Shrimali RK, et al. High dose neural stem radiation may not improve survival in glioblastoma. Clin Oncol 2017;29:335-43.